Undergraduate perceptions of the overall effectiveness of six types of mental health service providers (MHSPs) were obtained with a survey. Although many mental health services are available to consumers in the United States, research has indicated that these services are underutilized. Perceptions have been linked to therapeutic outcomes and may potentially serve as barriers to treatment. The results of the present study illustrate a range of perceptions and highlight the value of educating future consumers and practitioners about the roles of various MHSPs in providing mental health services. Future research is proposed. We know that recovery is possible; we know help is available, and yet, as a society, we often think about mental health differently than other forms of health. You see commercials on TV about a whole array of physical health issues, some of them very personal. And yet, we whisper about mental health issues and avoid asking too many questions. In many cases, treatment is available and effective. If there’s anybody out there who’s listening, if you’re struggling, seek help. To address this plea for mental health awareness at the national level, there is a need for research that identifies and targets the barriers that prevent individuals from seeking mental health services. The goal of the present study was to gain more insight regarding perceptions of the effectiveness of MHSPs. Results of this study offer a baseline for future research that could investigate how these perceptions influence help-seeking behaviors. According to the National Institute of Mental Health (NIMH; n.d.), about one in four American adults has a mental disorder that can be diagnosed. Mental illness is the leading cause of disability (NIMH, 2012), and suicide is the eighth leading cause of death in the United States (Russell, 2010). MHSPs (e.g., counselors, marriage and family therapists [MFTs], psychiatrists, psychiatric nurses, psychologists, social workers) offer critical services to their clients, advocate for mental health awareness, and stress the significance of the de-stigmatization of mental illness to the general public. Despite the services available, fewer than 37.9% of adults with mental illnesses receive treatment (Office of Applied Studies, 2009). 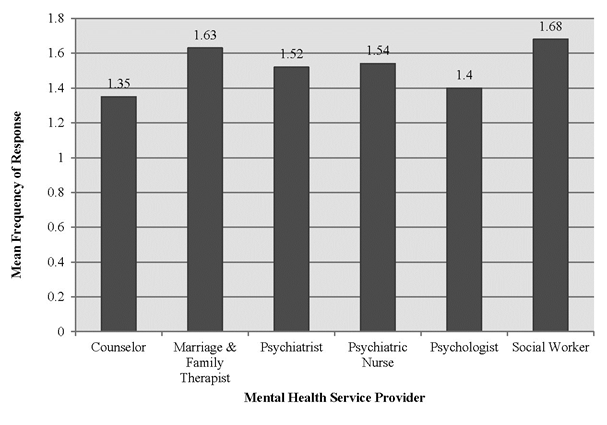 This statistic reveals some important research questions: Do individuals avoid seeking mental health services because they do not believe the service providers can effectively treat them? Do people seek help from some MHSPs more than others because they believe them to be more effective? According to World Health Organization’s 2001 report, the effectiveness of mental illness and substance abuse treatment has been well documented and has dramatically improved over the past 50 years. The 1995 Consumer Reports survey on the effectiveness of psychotherapy empirically supports the assertion that consumers benefit substantially from psychotherapy (Seligman, 1995). Participants in the study answered questions about the effectiveness of the treatment they received, how satisfied they were with the therapist’s treatment of their problems, and how their emotional state changed from the beginning to the end of therapy. Of the 426 participants who were feeling “very poor” when they began therapy, 87% reported that they were feeling “very good” or “good” by the time of the survey. No specific modality of psychotherapy was shown to be more effective than any other. Participants reported that primary care physicians were as effective as the other mental health practitioners in the short term, but significantly less effective in the long term. Those who sought treatment from a mental health professional rather than seeing only a primary care physician reported more improvement in the following domains: ability to relate to others, ability to cope with everyday stress, enjoying life more, personal growth and understanding, self-esteem, and confidence (Seligman, 1995). Still, when individuals are struggling with mental health issues, they most commonly consult their primary care physicians (Mickus, Colenda, & Hogan, 2000; Murstein & Fontaine, 1993). Research conducted by Deen, Bridges, McGahan, and Andrews (2012) offers insight into the role that cognitive factors play in the utilization of mental health services. Participants in their study were presented with vignettes that described depressive episodes and asked if they would seek help from (a) a medical doctor and (b) a counselor or therapist for the presented problem. Participants also were asked if they believed that seeing a medical doctor or counselor would help alleviate the presented problem. A higher perceived need for medical doctors over counselors or therapists was reported. Medical doctors were perceived by participants as more useful and had more favorable therapeutic outcome expectancies than counselors or therapists (Deen et al., 2012). Furthermore, a five-year study conducted by Su, Tsai, Hung, and Chou (2011) evaluated non-psychiatric physicians’ accuracy in recognizing disorders. In each case, the researchers recorded the primary care physician’s impression and referrals based on psychiatric diagnosis and then compared them with a psychiatrist’s final diagnosis. When the primary care physician was able to recognize psychiatric diagnostic criteria or common symptoms (e.g., low mood, loss of interest and negative thinking, acute confusion, consciousness disturbance, hallucination), this information was recorded as correct recognition. Five common psychiatric diagnoses were chosen for analysis: (a) depressive disorder (major depressive disorder and dysthymic disorder), (b) anxiety disorders, (c) substance use disorders, (d) delirium, and (e) psychotic disorders (schizophrenia, schizophreniform disorder, and brief psychotic disorder). Su et al. (2011) reported that the overall diagnostic accuracy rate was 41.5%. Substance abuse disorders were the most accurately diagnosed by physicians (70.2%) and psychotic disorders were the least accurately diagnosed (9.7%). The most common psychiatric symptoms that patients report are depressive symptoms, yet the detection of depression by physicians (31.4%) is historically low (Su, et al., 2011). Although pediatricians are instrumental in assessing and diagnosing the children’s mental health and behavioral challenges, they often state that their medical training does not fully prepare them to treat patients with learning disabilities, attention deficit disorders, mental retardation, substance abuse issues, or psychosocial problems (Russell, 2010). Clients who are seeking mental health services often perceive their primary care physicians and pediatricians as competent in providing mental health services, despite their lack of training on these specific issues. Moreover, many individuals suffer needlessly due to their primary care physicians’ lack of education regarding mental disorders (Tse, Wantz, & Firmin, 2010). MHSPs have tremendous overlap in the populations served, disorders treated, and services offered (Hanna & Bemak, 1997). The helping professions are represented by diverse training standards, licenses, specialties, philosophies and histories (Fall, Levitov, Jennings, & Eberts, 2000). Although professional diversity allows for the treatment of a wide range of ­issues, this also can cause confusion regarding which type of MHSP a client should consult in a time of need. While perceptions of the competence of helping professionals can greatly affect utilization of services (Firmin, Wantz, Firmin, & Johnson, 2012), a review of the literature indicates that misperceptions are common. Perceptions of MHSPs are important factors in the treatment outcomes of counseling (Firmin et al., 2012). According to Wampold (2001), client expectancy concerning the effectiveness of counseling accounts for 15% of the therapeutic outcome, and factors that clients carry into counseling (e.g., perceptions of MHSP competence and expertise) account for an astounding 40% of the therapeutic outcome. The therapeutic alliance alone accounts for 30% of the outcome of treatment (Wampold, 2001). Client perceptions of an MHSP’s competency in regard to treating specific needs have an effect on the therapeutic alliance as well as clients’ ability to facilitate positive changes in their lives. According to Meyer et al. (2002), client expectancy concerning the effectiveness of counseling is critical and often sufficient for inspiring positive change for the client. As far back as 1973, Frank asserted that counseling is most effective when both the client and counselor believe in the effectiveness of the intervention. Based on past analyses of the link between the expectancy factor and the therapeutic alliance, and their effect on treatment outcomes, the authors propose that creating more awareness and more positive perceptions of the overall effectiveness and accessibility of MHSPs would ultimately increase positive outcomes in counseling. College undergraduates’ perceptions of MHSPs are important for a number of reasons. First, the future of the helping profession depends on the incoming generation of undergraduate students, who are making decisions regarding which fields they will work in, and who may consider the helping professions. Career choices are related to well-being and overall life satisfaction (Steger & Dik, 2009). According to Roese and Summerville (2005), the most frequently identified life regrets for Americans involve their educational choices. Because educational choices have been consistently linked with life satisfaction, the accuracy of undergraduate perceptions of MHSPs merits more in-depth exploration. Attending college can be a major life transition for students, accompanied by new pressures, stress, and surfacing mental health concerns. Most mental disorders are identifiable before or during the traditional college age of 18–24 (Kessler et al., 2005). According to the National Institute on Alcohol Abuse and Alcoholism (NIAAA, 2012), about four out of five college students consume alcohol. About half of the college students who drink partake in binge drinking. Around 25% of college students disclosed academic consequences because of their drinking (e.g., missing class, falling behind, performing poorly on assignments, receiving lower grades overall). These statistics indicate an increasing need for mental health and substance abuse counseling among college students. Universities provide a number of resources to their students, yet they are underutilized (Watkins, Hunt, & Eisenberg, 2012). Research focused on undergraduate perceptions of MHSPs could encourage more utilization of MHSP services, potentially motivate more students to join the MHSP workforce, and support a more accurate overall perception and portrayal of the effectiveness and competence of MHSPs. Since perceptions have been linked to help-seeking behaviors, a primary goal of the present study was to gain insight into how college students perceive the effectiveness of the various MHSPs. Data was collected from participants who were enrolled in a general psychology course at a private Midwestern university (N = 261). Participants were surveyed regarding their perceptions of MHSPs. The general psychology course provided a sample spanning a cross section of the university’s 100 academic majors. Participants represented the freshman, sophomore, junior and senior class levels (Mage= 18.5; range = 17–55 years). Our study included 167 women (64%), 92 men (35%), and two participants that did not report gender (1%). The sample consisted primarily of Caucasian students (91%), while 9% were identified as ethnic minorities. Two participants opted out for undisclosed reasons. Participants reported home residences in 34 U.S. states (including 33% OH, 10% MI, 7% IN, and 6% PA). A self-administered questionnaire was developed for the present study in order to evaluate six MHSPs (e.g., for various clinical situations, source of knowledge, and characteristics). Participants were asked to respond to the following question: In general, what is your opinion about how overall effective each of the following MHSPs (counselors, MFTs, psychiatrists, psychiatric nurses, psychologists, and social workers) would be with helping a mental health client? Response options were based on a 4-point Likert-type scale: 1 (positive), 2 (neutral), 3 (negative), or 4 (unsure). The survey asked each participant to designate which MHSPs he or she would recommend for several clinical situations using a 3-point Likert-type scale: 1 (Yes, I would recommend this MHSP), 2 (No, I would not recommend this MHSP), or 3 (Not sure, not familiar with this MHSP). Participants also were asked to identify a source from which they had learned about the MHSP. A 3-point Likert-type scale was utilized to indicate if the source information was presented in a: 1 (positive), 2 (neutral), or 3 (negative) way. Lastly, participants categorized MHSPs based on the following: personal attributes (e.g., competent, intelligent/smart, and trustworthy); job-related activities (e.g., diagnose and treat mental and emotional disorders, and prescribe medication); requirements (e.g., can be in independent private practice, doctoral degree required to practice, and over-paid); or not familiar with MHSP. An initial pilot study was conducted in order to address and resolve ambiguities before the final survey was administered. A total of 12 students participated in the pilot survey; data obtained from the initial study were not included in the present research. The survey was administered anonymously and was designed to take 20–25 minutes to complete. MHSPs were presented randomly throughout the survey as suggested by Sarafino’s (2005) protocols. IRB approval for the study was obtained prior to data collection and informed consent was obtained. Participants elected to complete, partially complete, or not complete the survey. The survey was administered during regular class time with no extra credit or other incentives awarded for participation, providing little chance for coercion. Analyses focused on participant perceptions of the overall effectiveness of MHSPs in working with a potential mental health consumer. The following is a ranked list of the MHSPs from most positive to least positive by the frequency of perceptions: counselors, psychologists, psychiatrists, MFTs, social workers, and psychiatric nurses. A visual comparison of participant responses is provided in Figure 1. The frequency of participants reporting negative perceptions ranked from highest to lowest in the following order: social workers, MFTs, psychiatric nurses, psychiatrists, counselors and psychologists. When participants were asked to identify their opinions in regard to the overall effectiveness of each of the MHSPs in helping a mental health consumer, participants selected the “don’t know” option as follows: psychiatric nurses (17.6%), MFTs (8.8%), psychiatrists (7.3%), psychologists (5.7%),social workers (4.2%), and counselors (3.1%). Figure 1. Undergraduate perceptions of the overall effectiveness of MHSPs. Since the same participants rated each of the MHSP categories, t-tests were used to compare category means as represented in Figure 2. As expected, the data suggests significant differences in perceptions of MHSPs’ overall effectiveness when comparing the means from each MHSP category. Perceptions of the overall effectiveness of MFTs (M = 1.63, SD = .703) were significantly more negative than the perceptions of the overall effectiveness of professional counselors (PC; M = 1.35, SD = .532); t (234) = 5.648, p < .001, as well as the overall effectiveness of psychologists (M = 1.40, SD = .539); t (226) = 4.05, p < .001. MFT overall effectiveness (M = 1.63, SD = .703) was perceived to be significantly more positive than psychiatric nurse overall effectiveness (M = 1.54, SD = .624); t (203) = 2.104, p < .05. Counselor overall effectiveness (M = 1.35, SD = .532) was perceived to be significantly more positive than psychiatrist overall effectiveness (M = 1.52, SD = .612); t (238) = –3.589, p < .001. Psychiatrists were perceived as less effective overall (M = 1.52, SD 612) than psychologists (M = 1.40, SD = .539); t (236) = 2.934, p <.01. Figure 2. A comparison of the category means of the perceptions of overall effectiveness of MHSPs (lower scores are more positive). Social workers received the highest percentage of unsure student responses (36.8%), followed closely by psychiatrists (36.4%), and MFTs (34.9%). These findings suggest the need for information and advocacy for these MHSPs in particular. Data from the present study also suggest that social workers have the highest amount of variance in participant responses (.520), while MFTs rank second (.486). For this study, variance is possibly an indication of misinformation and discrepant beliefs regarding the effectiveness of the MHSPs. Counselors had the least amount of variance (.281) when compared to the other MHSPs, suggesting that participants had more similar perceptions of counselor overall effectiveness when compared to the variance in perceptions of the other MHSPs. The U.S. Surgeon General’s 1999 report on mental health stated to the American people that “the efficacy of mental health treatment is well-documented,” and recommended to “seek help if you have a mental health problem or think you have symptoms of mental illness.” (U.S. Department of Health and Human Services (UDHHS; 2000, p. 13). The report further stipulated that stigmatization of mental illness is the greatest obstacle the United States faces in furthering the progress of individuals seeking mental health services (USDHHS, 2000). The present study highlights the need for the advocacy of MHSPs. Specifically, social workers, MFTs, and psychiatric nurses were perceived as significantly less effective overall than psychiatrists, counselors, and psychologists. This coincides with Consumer Reports’ 1994 Annual Questionnaire in which 4,000 subscribers who received some kind of mental health care between 1991 and 1994 responded to questions about their mental health care. This survey showed that participants were satisfied seeing social workers, psychologists, or psychiatrists (“Mental Health,” 1995). 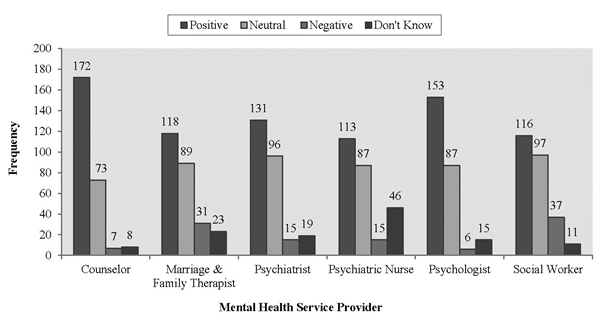 Those seeing a marriage and family therapist were slightly less satisfied (“Mental Health,” 1995). Overall, this report provided a positive recommendation to seek MHSPs for mental health issues. Consumer Reports’ 2009 Annual Questionnaire once again queried its subscribers on the efficacy of mental health providers working specifically with depression and anxiety (“Depression & Anxiety,” 2010). This survey of 1,544 respondents, who had sought help for depression, anxiety, or other mental health problems between January 2006 and April 2009, found that psychologists, social workers, and licensed professional counselors were all equally helpful in providing relief for depression and anxiety (“Depression and Anxiety,” 2010). Of concern from the present study is that for all MHSP categories, significant percentages of the participants reported a total absence of knowledge regarding MHSP overall effectiveness. This is one reason we recommend that counselors and counseling professional organizations (e.g., AMHCA, ACA, ACCA, CACREP, NBCC) increase their emphasis on professional advocacy. In a broader sense, research regarding the methods through which people learn about MHSPs could identify more specific opportunities and venues for advocacy. The American College Counseling Association (ACCA) provides marketing strategy suggestions for reaching university faculty, staff, administrators and students: campus publications; campus television and radio shows; flyers posted around campus; e-mails; sponsoring anxiety, depression, and eating disorder screening days; table tents and banners in the cafeteria and student center; sponsoring career counseling week; guest speakers for classes and organizations; distributing brochures around campus; sponsorship and programming for Mental Health Awareness Month; developing mental health “theme of the month” campaigns; placing counseling advertisement kiosks in heavy traffic areas around campus; and hosting an open house (Mattox, 2000). These types of marketing actions are imperative and could be extended beyond university campuses. For example, public service announcements targeted toward specific consumers, mass media campaigns and the use of social networking for advocacy might be effective ways of reaching the increasingly tech-savvy generation. This approach could potentially be instrumental in decreasing the stigmatization of individuals who seek treatment for mental health-related issues and increase the awareness of services that are available. The Council for Accreditation of Counseling & Related Education Programs (CACREP) could enhance activism for the helping professions by requiring students to demonstrate advocacy at both the master’s and doctoral levels. The American Counseling Association (ACA) and the American Mental Health Counselor’s Association (AMHCA) can direct ongoing advocacy efforts by increasing the ease of access to information related to the effectiveness of MHSPs for undergraduates. Counseling organizations can provide support for young professionals who are interested in joining the helping profession by empirically validating and improving perceptions of the overall effectiveness of MHSPs. Future researchers are encouraged to explore the specific attitudes and perceptions that serve as barriers to the utilization of mental health treatment. Researchers should consider delineating therapeutic outcomes based on the specific type of provider (e.g., counselors, MFTs, psychiatrists, psychiatric nurses, psychologists, social workers). Of particular interest would be comparing the actual therapeutic outcomes of MHSPs to student perceptions of MHSP competence in treating specific mental disorders. The helping professions also could explore the perceptions of the overall effectiveness of MHSPs in comparison to those of primary care physicians. Participants in the present study were not asked if they had received mental health services themselves. This is an important limitation to consider since perceptions of the effectiveness of MHSPs are likely influenced by firsthand experiences. In much the same way, a lack of familiarity or experience with MHSPs could potentially influence perceptions. The sources by which individuals learn about mental health–related issues could identify specific areas that can be utilized for advocating for the helping professions. For example, do people learn about mental health issues from movies, television, the Internet, commercials, newspapers, books, magazines, classes, friends, family members, firsthand experiences, or other sources? Is the information that individuals receive from these sources providing a foundation for accurate perceptions of the effectiveness of MHSPs? How do the attitudes founded on information from various sources influence help-seeking behavior? Research on these topics might provide further direction for professional advocacy. Another limitation of the current study is that participants attended college in one geographical location. Though the participants represented 34 of the 50 states and spanned a wide range of academic majors, the results of the present study cannot be generalized to other types of institutions nationwide. All participants in this sample were undergraduate students, and therefore the results cannot be generalized to other populations. Confounding effects associated with the limitations of collecting data from a single university could be reduced by studying a larger and more nationally representative sample of private and public institutions or by comparing and contrasting results from various regions of the country. Perceptions of the general population should be explored for more generalizable results. On a final note, an important limitation of the present study is that only 9% of the participants identified themselves as ethnic minorities. We recommend further investigation of ethnic minority perceptions of MHSPs. Future studies also could focus on socioeconomic status, marital status, sexual orientation, age and gender as moderating variables. Depression and anxiety: Readers reveal the therapists and drugs that helped. (2010, July). Consumer Reports, 75(7), 28–31. Fall, K. A., Levitov, J. E., Jennings, M., & Eberts, S. (2000). The public perception of mental health professions: An empirical examination. Journal of Mental Health Counseling, 22, 122–134. Firmin, M. W., Wantz, R. A., Firmin, R. L., & Johnson, C. B. (2012). Sources by which students perceive professional counselors’ effectiveness. The Professional Counselor: Research and Practice, 2, 33–42. Frank, J. (1973). Persuasion and healing: A comparative study of psychotherapy (2nd ed.). Baltimore, MD: Johns Hopkins University Press. Mattox, R. (2000). Building effective campus relationships. In D. C. Davis & K. M. Humphrey (Eds. ), College counseling: Issues and strategies for a new millennium (pp. 221–237). Alexandria, VA: American Counseling Association. Mental health: Does therapy help? (1995, November). Consumer Reports, 60(11), 734–739. Murstein, B. I., & Fontaine, P. A. (1993). The public’s knowledge about psychologists and other mental health professionals. American Psychologist, 48(7), 839. Sarafino, E. P. (2005). Research methods: Using processes and procedures of science to understand behavior. Upper Saddle River, NJ: Pearson/Prentice Hall. Wampold, B. E. (2001). The great psychotherapy debate: Models, methods, and findings. Mahwah, NJ: Lawrence Erlbaum. Ashley M. Ackerman is a graduate student at Wright State University. Richard A. Wantz, NCC, is a Professor of Counselor Education at Wright State University. Michael W. Firmin, NCC, is a Professor at Cedarville University. Dawn C. Poindexter is a graduate student at Wright State University. Amita L. Pujara, NCC, is an Adjunct Instructor at Wright State University and Life Therapist at South Community Behavioral Health Care, Inc. Correspondence can be addressed to Richard A. Wantz, Department of Human Services, College of Education and Human Services, 3640 Colonel Glenn Highway, 108V AL, Wright State University, Dayton, OH 45435-0001, richard.wantz@wright.edu.